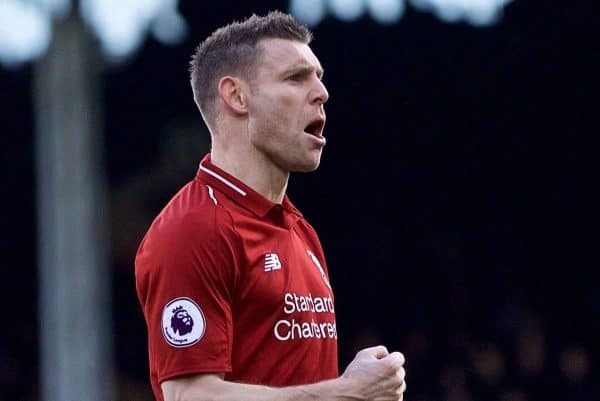 Liverpool went back to the top of the Premier League as a James Milner penalty secured a 2-1 victory away to Fulham on Sunday afternoon. On a high from their 3-1 triumph at Bayern Munich in midweek, the Reds headed into their last game before the international break looking to return to the top of the Premier League. With Man City busy in the FA Cup, victory for Jurgen Klopp‘s side would ensure they leapfrogged the champions and heap pressure on them to win their game in hand. Klopp was forced to deal with a host of injuries before the trip to west London, however, and made two changes to his starting lineup from the Champions League, with Fabinho and Adam Lallana replacing Milner and Jordan Henderson. Liverpool had won all of their last five meetings with the Cottagers prior to Sunday’s clash, and they extended that run despite making it difficult for themselves. As expected, the Reds’ controlled the opening stages with a dominant approach, but had few opportunities in the first 10 minutes, with Andy Robertson producing a poor cross after being found by a beautiful raking pass from Joel Matip. Mohamed Salah was the target for the majority of Liverpool’s attacks, as the Egyptian used his pace to find space behind the Fulham back line and latch onto long, diagonal balls. But it was Sadio Mane again who scored the opener, playing a brilliant one-two with Roberto Firmino as he made a sweeping run into the box to fire into the back of the net for his 11th in 11 games and his 20th of the season. 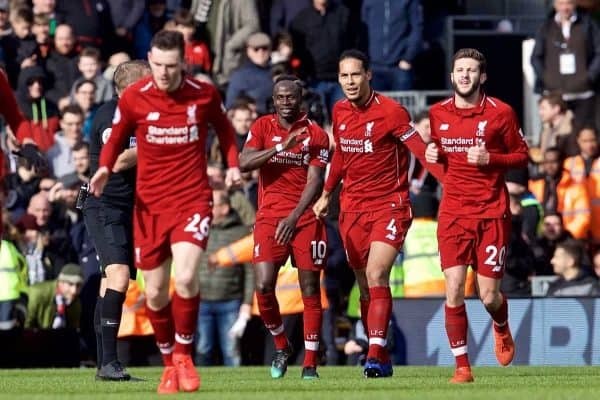 Liverpool could have capitalised further but were sloppy in possession on a number of occasions, while a late tackle saw Fabinho pick up a yellow card which made the midfield battle more difficult. The Brazilian was fortunate to avoid a sending off after another poor challenge soon after, and Klopp will have been relieved to see him leave the field with the rest of his team-mates as the half-time whistle blew at 1-0. The second half followed a similar line, with Liverpool continuing to open up Fulham through long passes out to Robertson and Trent Alexander-Arnold, edging closer to a second goal. In fact, the home side thought they had beat Alisson and secured an equaliser as Floyd Ayite’s header eluded the Brazilian’s grasped, but the forward was rightly adjudged to have been offside. 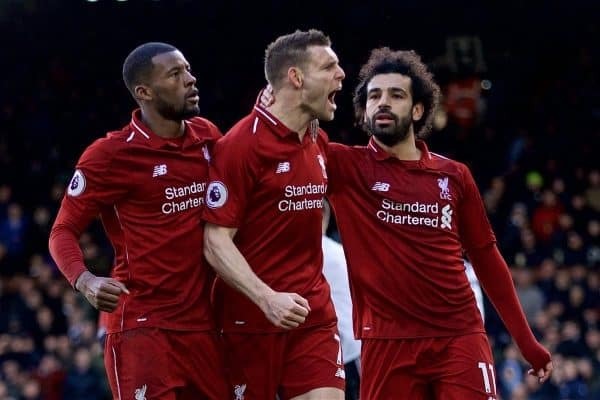 This served as a warning for the Reds as they showed complacency with a series of wasted attacks, as did a bright counter led by Ryan Babel that eventually saw Alisson save from Andre-Frank Zambo Anguissa. And then a mixup between Van Dijk and Alisson, after a skewed clearance from substitute Milner, allowed Babel a tap-in against his former club. But a mistake from Sergio Rico allowed Liverpool back in front, bringing down Mane after spilling Salah’s shot, with Milner stepping up to convert the spot-kick and tie up the win.